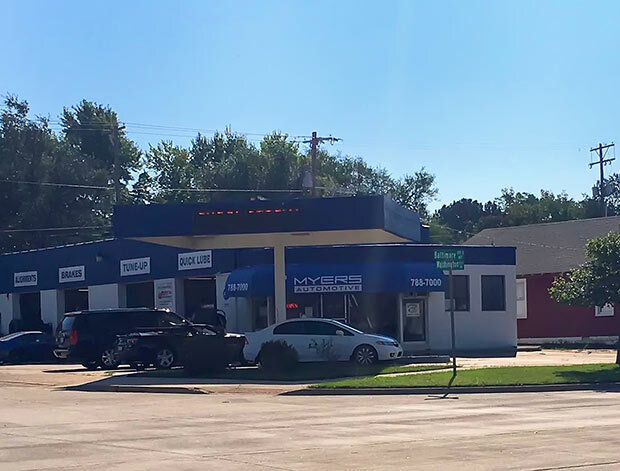 Myers Automotive has one of four auto repair shops in Derby, Kansas. Conveniently located on N Baltimore Avenue, our Derby location services all types of vehicles including domestic, import, diesel, hybrid, and fleets. We have a team of knowledgeable, friendly, ASE-certified technicians who put our customers first. Every repair is completed timely and effectively, backed by a 3-year, 36,000 mile warranty. We also offer complimentary rides to or from your work or home upon request, so you can continue with your busy life while your car is in our shop. If you would like to make an appointment, call our Derby repair shop at 316.788.7000 or book an appointment online.